We, at Soliclima, customize the best isolated photovoltaic installations, so that they are never without power. All our independent installations carry an auxiliary electrogenetic group, that allow to enjoy having electricity on cloudy days. There is the possibility of transforming a solar photovoltaic installation in a much more versatile and reliable one. You can connect a small wind turbine getting an hybrid, not just the sun. This is the best option to cover the electricity nees of rural dwellins located at the mountains, where sun and wind are avaliable. Due to our ability to find solutions together with extensive experience, we can make use of renewable energy source for applications that best suits your energy and economic needs. Solar power, also called solar photovoltaic energy is got directly from the sun. Sun is a free and inexhaustible energy source, and its applyment doesn't produces greenhouse effect gases. We use then some solar panels to produce electricity during the day, storing it in a battery to be used also during the night. We calculate and develop the optimal solar power system for the needs of our custom. That is why our facilities are provided together with an electrical generator to ensure electricity supply even when it is raining. In fact, solar power can be sold to the electricity company or applied to autoconsumption. It is specially appreciated there where there is no grid electricity, in farms or rural dwellings. Many clients have asked us about the posibility of becoming independent from the electricity company generating the own solar power. But we strongly advise against this option from many reasons: it is more expensive than using the company services, it is less comfortable, it requieres more maintenance, among other reasons. ¿ Which are the useful applications of solar power ? Solar power is mainly used in single family residendences far away from electrical grid or for farming purposes. In brief, in the country or the mountain, where electricity is needed but there is no electrical connection. It is often interesting to mix solar power and wind energy, or even hydro-hydraulic energy, depending on the conditions. Hydro-hydraulic energy has the advantage that it produces electricity without interruption. Solar power generation requires some previous calcultaions to know exactly what devices are needed for that project. The determinant factor to have in mind is the predicted consumption. That is why is of vital importance to decide, in case it isn't yet decided, and to list in detail the electrical devices which will need electricy. For example, 6 light bulbs of low consumption 20 W each. We have also to calculate the average consumption per day, for example two hours of television per day, and even to detail if the consumption will be everyday or concentrated on weekends. Any variation in this calculations can avoid the proper working of the solar power facility, for example to add a washing machine, producing technical problems. Solar energy is stored in light particles: photons. Solar panels use solar cells made of certain semiconductors, such as silicon. Silicon atoms absorb the energy contained in the photons and transform it in electricity. This electricity is picked up through some metalic wires that conduce it to the other electrical devices of the installation. It controls the input of electricity into the battery and protect it against overloading and other problems that could damage it. Advanced models switch on electrical group when battery is in risk. It is necessary to inject the electricity in batteries to have it available when it is needed, usually at night. There are two main batteries types. - monoblock batteries: they are similar to those of the cars, but they are cheaper. Disadvantages are that they have a shorter life time than other batteries and need more maintenance. - stationary batteries: they are more appropriate for these systems then their durability and versatility are bigger. They can be connected on serial. Before it arrives to 80% of discharging, it is necesarry to charge the batteries again, to avoid damages. it converts Direct Current -the one produced in the panels- in Alternating Current -the one our electrical devices need. As auxiliar device, electrical generator, usually moved with diesel, generates electricity when there is no sun, or when batterie is discharged. It is the regular revision of the electrical devices in accordance with the manufacturer specifications. Breakdowns, when used properly, are very uncommon, and usual meteorological conditions don't affect them. Sun & Climate offers Technical Support with this aim. There are different types of grants, subsidies and incentives, depending on the country and the state. 4 autonomous photovoltaic solar panels of 125 Wp each, a solar regulator, 6 stationary batteries and an inverter for outdoor night lighting. A structure with tracks on which the photovoltaic modules and other elements are mounted, had to be design. Anchoring system for roof tiles. 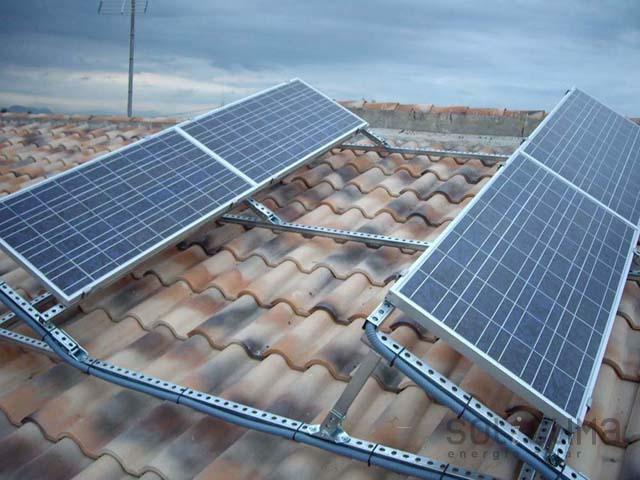 Due to the unfortunate direction of the roof, it was necessary to modify the orientation of the plates, to optimize the solar radiation received. The installed power is 500 Wp for an average of 1100 Wh/day. The facility is equipped with a battery regulator.